"Oliver Corporation" redirects here. For the typewriter manufacturer, see Oliver Typewriter Company. Four companies joined forces on April 1, 1929. The Oliver Chilled Plow Company dated from 1855. 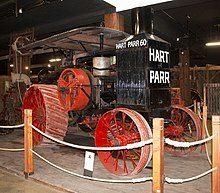 Hart-Parr Tractor Company began operations in 1897, and the American Seeding Machine Company, dated back to 1848. Nichols and Shepard Company, likewise began operations in 1848. By 1929, each of these companies had essentially outgrown its usefulness to the industry. For most of them, the market had some time earlier reached a saturation point. In some instances, their machines were badly dated and rapidly approaching obsolescence. For each of these companies to have attempted further activity on solo basis would almost have certainly been disastrous. By uniting their various and somewhat diverse product lines into a single company, Oliver Farm Equipment instantly became a virtual full-line manufacturer. The American Seeding Machine Company was organized in 1903 from the a merger of seven different manufacturers of grain drills, corn planters and other "seeding machines." The leading corporate component among the seven merged companies was the Superior Drill Company of Springfield, Ohio. :189 Accordingly, the American Seeding Machine Company established its corporate headquarters at Springfield in the facilities formerly operated by the Superior Drill Company. :189 Other companies which formed the 1903 merger include P. P. Mast and Company (est. 1856), Hoosier Drill Company (est. 1857), the Empire Drill Company, and Bickford & Huffman. The Superior Drill Company name lived on for many years following the merger that created Oliver, in the "Oliver Superior" line of seeding drills and related equipment. The business called the Oliver Chilled Plow Works was established by James Oliver in 1853.:107 James Oliver first settled in Mishawaka, Indiana in 1836 where he worked in a local foundry business. Later he bought into an already existing small foundry in South Bend, Indiana. Plows with cast iron bottoms and moldboards had been successfully used by farmers and planters in the eastern states of the United States since the time of Thomas Jefferson. :107-108 However, in the sticky soils of North Dakota and various other portions of the Midwest, the cast iron plows would not "scour"; that is, the sticky soil would cling to the plow, disrupting the flow of soil over the plow's surface, making plowing impossible. Thus, when settlement of North America moved over the Allegheny Mountains into the Midwest, there was a real need for a new plow that would scour in the soils of the Midwest. To allow a cast iron bottom to scour in sticky soil, various methods of heat treating for creating a hardened surface on the metal plow bottom had been attempted. All of these processes failed because the hard surface created was very thin and would soon wear through to the soft iron under the heat-treated surface. James Oliver developed his sand casting process to include rapid chilling of the molten iron near the outside surface of the casting, which resulted in a bottom that had a thick hardened surface with far greater wearability than competing plow bottoms. The entrance to the Oliver Chilled Plow Works in South Bend, Indiana, c.1880. Another problem common to cast iron plow bottoms was the lack of soundness and uniformity in the metal's molecular structure, which meant that some cast iron bottoms would have soft spots in the hardened surface, reducing the wearability of the plow bottom. Improvements made by James Oliver to his casting process overcame this problem also. :107 Consequently, on June 30, 1857, James Oliver obtained his first patent from the United States government for his chilled plow shares and in February 1869, he obtained another patent for his process. What Oliver accomplished by this invention is sometimes referred to as chill hardening, or simply chilling. The purpose of chilling, whether it be a plowpoint or a wheel for a railroad car, is to produce an extremely hard and durable exterior of the object. This is done by including "chills", pieces of metal, into the sand mold, such that when the molten iron is poured into the mould, the portion next to the chill cools rapidly, hardening in a way akin to quenching. This chilled area forms the exterior of the plowpoint. This metal cools more quickly than the metal which forms the other portion of the plowshare, and effectively becomes case hardened. Also, the vapors which arise as the molten metal comes in contract with the mould are expelled through a spout. Had these vapors been trapped in the mould, they would have caused impurities and would have weakened the plowpoint at the place where it should have been the hardest. To harden the plowpoints, Oliver arranged his moulding apparatus in such manner that the surface of the chill was in a position so that the melted metal first came into contact with the chill at the edge of the plowshare. This insured a hard plow cutting point. An artist's conception drawing of an aerial view of the Oliver Chilled Plow Works, South Bend, Indiana, c.1900. In 1900, as the engine business expanded, Hart and Parr decided to move their company from Madison to Charles City. Hart-Parr Company was organized on June 12, 1901 at Charles City, Iowa. Ground was broken for the new factory on July 5 that year. By the following December, the Hart-Parr Company was now ready to do business, and had an authorized capitalization of $100,000.00. Hart-Parr number 1 was completed in 1902. Customers did not immediately beat the proverbial path. However, Hart-Parr was able to field one salesman to run demonstrations at county fairs and other events. Hart was patient. "We can't force it," he said. "We have to let it simmer into the market." Little by little, the Hart-Parrs began to gather defenders. Some of the first tractors delivered were gaining a reputation of usefulness that far surpassed that of the steamers. W.H. Williams, Sales Manager in 1907, decided the words "traction engine" were vague and too long to be used in press releases, so he coined the word "Tractor", a combination of the words traction and power, instead. For this reason, and because the Charles City plant was the first to be continuously and exclusively used for tractor production, Hart-Parr often used the slogan "Founders of the Tractor Industry" in their advertising. For the first couple of years, the tractors carried the Oliver-Hart-Parr designation, but the Hart-Parr essence soon disappeared, just as an entirely new line of purely Oliver tractors made their appearance. In 1943, the Oliver Farm Equipment Company purchased the Ann Arbor Agricultural Machine Company of Ann Arbor, Michigan. Founded in 1885, the Ann Arbor Agricultural Machine Company became the leading manufacturer of "hay presses" or stationary balers. 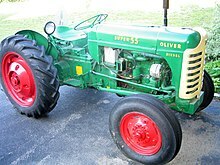 The Cleveland Tractor Company became a part of the Oliver family in 1944. At the October 3, 1944 stockholders meeting, with approval of the stockholders, the corporate name was changed to "The Oliver Corporation". Crawler tractor production ended at Charles City in 1965. In 1952 the A.B. Farquhar Company was sold to the Oliver Corporation. Founded in York, Pennsylvania, in the 1850s as W.W. Dingee & Co, in 1861 young businessman Arthur Briggs Farquhar bought the business and enlarged it during the Civil War as the Pennsylvania Agricultural Works. In 1889, the A. B. Farquhar Company began building threshing machines and other farm machinery. Later, the company started the production of cultivators for farm use (especially potato harvesting equipment). Farquhar produced some steam engines early then moved onto the production of traction engines. In 1944 Oliver acquired the Cleveland Tractor Company (Cletrac). They continued production of the existing Cletrac HG model until 1951. The agricultural Cletrac HG gradually evolved into the more industrial Oliver OC-3 which was produced from 1951 through 1957. In 1956 Oliver announced the slightly larger OC-4 with a four-cylinder Hercules IXB3 engine. In late 1957 (diesel) and early 1958 (gas) OC-4's came equipped with 3 cylinder Hercules 130 engines. Most noticeable was the change to a 'beefier' more industrial front grill. In 1962 at the new Charles City, Iowa crawler production line, the last incarnation of the OC-4 was produced. It was a sturdier industrial model named the Series B. They were powered with the same 3 cylinder Hercules GO-130 and DD-130 engines of the mid-series models. The OC-4 product line was discontinued in 1965. Oliver also produced larger crawlers: the OC-6 from 1953 to 1960; the OC-9 from 1959 to 1965; the OC-12 from 1954 to 1961; and the OC-15 and the large OC-18. All crawler production was halted in 1965. In 1948, Oliver was ready with an entirely new line of tractors. These were built over the successes of the past, including the Oliver 60, 70, and 80 tractors. The latter was even built with a diesel engine, although very few were sold. However, in the 1950s, Oliver was an industry leader through their promotion of diesel power. Oliver led the industry in the sale of diesel tractors for several years. The Oliver 66, 77 and 88 tractors of the 1948 to 1954 period, marked an entirely new series of Fleetline models. The 77 and 88 could be bought with either gasoline or diesel engines. During 1954, the company upgraded these tractors with the new "Super" series models, and added the Oliver Super 55. It was the company's first compact utility tractor. In 1958, Oliver began marketing the new 660, 770, 880, 990, and other new models. During the war years of the 1940s Oliver Corporation expanded rapidly into non-agricultural production, most notably in the defense sector. By 1947, the Oliver Corporation employed 9,000 with 37% of Oliver's production for defense contracts. Product lines included graders, forklifts, road rollers, crawlers, and power units incorporated into products by other companies. Oliver also built airplane fuselages for Boeing RB-47E Reconnaissance planes at a Battle Creek, Michigan aviation division set up exclusively for defense contracts. The Charles City, Iowa plant assembled transmissions for the 25-ton crane carriers and built and assembled 106mm recoilless rifle gun mounts for the Army. The Cleveland, Ohio plant built the MG-1 crawler for the Army as well as tank parts. The Gilroy, California plant produced the 76mm guns for the Walker Bulldog tank. The Shelbyville, Ohio plant built 155mm Howitzer gun parts. White also acquired Cockshutt Farm Equipment of Canada in February 1962, and it was made a subsidiary of Oliver Corporation. Cockshutt had also previously, in 1928, marketed tractors made by Hart-Parr, and again from 1934 through the late 1940s it marketed tractors made by Oliver, only changing the paint color to red, and changing the name tags to Cockshutt. Minneapolis-Moline became a wholly owned subsidiary of White Motor Corporation in 1963. The Cockshutt and Minneapolis-Moline lines were blended into that of Oliver until there was virtually no difference between them. In 1960, the new four-digit tractor models appeared. Among them were the 1600, 1800 and 1900 models. In 1969 White Motor Corporation formed White Farm Equipment Company, almost immediately after a transitional period when virtually identical tractors and combines were marketed under different trade names. A few models were sold as Oliver, Minneapolis, or Cockshutt, the major difference being the paint colour. As the transaction continued, the White name was more and more applied to the tractor line, with the Oliver 2255, also known as the White 2255, being the last purely "Oliver" tractor. With the introduction of the White 4-150 Field Boss in 1974, the White name would be used, henceforth to the exclusion of all others. White Motor Corporation shut down the original Oliver Chilled Plow Works factory (factory no. 1) in 1985. The Oliver buildings remained vacant until 2002 when most were demolished to make way for an industrial park. The Oliver powerhouse is now restored and occupied by Rose Brick & Material. 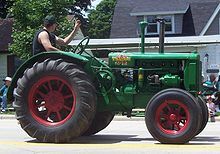 FIAT tractors were marketed under the Oliver name in the mid 1970s, such as the Oliver 1465 tractor. Oliver tractors with FIAT gages were available in 1970. More information about Oliver Tractors can be found in Oliver Heritage Magazine. Today White is an AGCO brand. AGCO was formed in 1990 by former Deutz-Allis executives. The executives took over Deutz-Allis and then purchased the White tractor line in 1991. The White tractor line was produced by AGCO from 1991 through 2001 when the White line was merged with AGCO-Allis to create the AGCO brand. The White name continues on under AGCO with the White Planter division. ^ a b c d e f g h i j k l m n o p Wendel, Charles H (1993). Oliver Hart-Parr. Osceola: Motorbooks International. ISBN 9780879387426. Retrieved 2018-12-07. ^ a b c d e Wendel, Charles H (1997). Encyclopedia of American Farm Implements & Antiques. Iola WI: Krause Publications. ISBN 9780873415071. Retrieved 2018-12-07. ^ Davis, H. Gail (1908). "The Story of James Oliver and The Oliver Chilled Plow Works". 1. Personal Papers collection housed in the Archives of the Center for History, South Bend, Indiana: n/a. Archived from the original on 2009-08-25. ^ United States Patent Office, Letters Patent No. 17694, "Improvement in Chilling Plowshares," June 30, 1857, to James Oliver and Harvey Little. ^ "Labor Riots in Progress". New York Times. 14 January 1885. ^ "Labor Riots". Chicago Daily Tribune. 14 January 1885. ^ "Industrial News". Chicago Daily Tribune. 20 February 1885. ^ a b c d e f Pripps, Robert N; Morland, Andrew (1994). Oliver Tractors. Motorbooks International. ISBN 9780879388539. Retrieved 2018-12-07. ^ Finlay, Mark R. (1998). "System and Sales in the Heartland: a Manufacturing and Marketing History of the HartParr Company, 1901-1929". Annals of Iowa. State Historical Society of Iowa. 57 (4): 368. ISSN 0003-4827. ^ ""What does it cost to plow an acre?" [advertisement]". Journal of the American Bankers Association. 12: 569. March 1920. Retrieved 19 January 2016. ^ ""The 1923 Hart-Parr Franchise Is Now Ready" [advertisement]". Tractor and Gas Engine Review. 15: 13. October 1922. Retrieved 19 January 2016. ^ a b Culbertson, John D (2001). The Tractor Builders: The People Behind the Production of Hart-Parr/Oliver/White. Sunrise Hill Associates. Retrieved 2018-12-07. 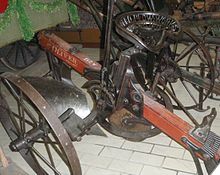 Wikimedia Commons has media related to Oliver Farm Equipment. This page was last edited on 7 December 2018, at 11:08 (UTC).